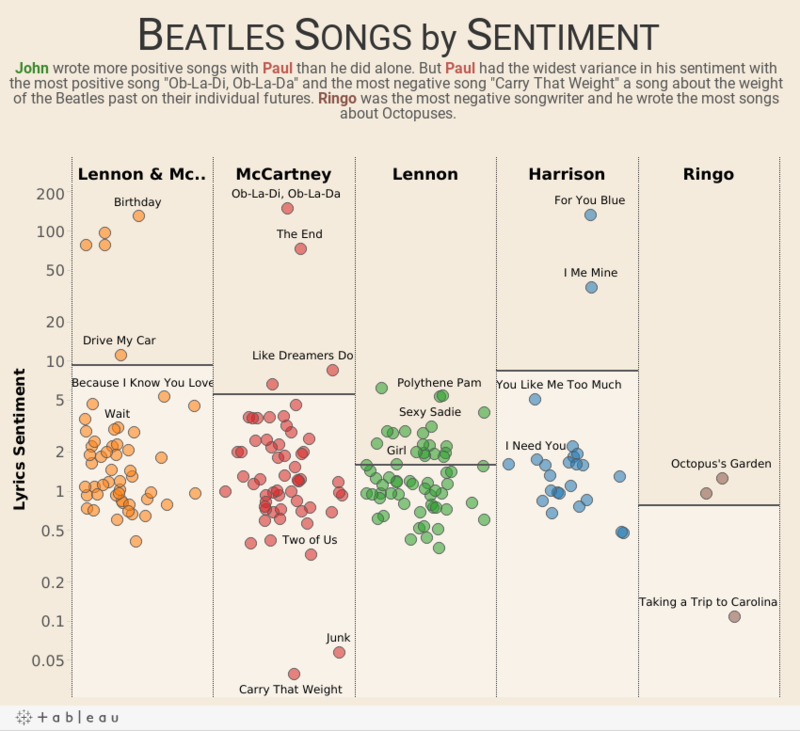 This analysis looks at the sentiment of all Beatles songs by songwriter similar to the Beatles analysis I did a few months ago. For this analysis I analyzed the lyrics of every Beatles song using the sentiment package in R which classified the Bayesian polarity of every song. Not sure if you're familiar with earlier work done by Petrie et al. of the Beatles songs over the same time period. Their findings were published in an article entitled "Things We Said Today: A Linguistic Analysis of the Beatles" found in the APA's journal Psychology of Aesthetics, Creativity, and the Arts 2008, Vol. 2, No. 4, 197–202. Although much more detailed (obviously it was an academic research paper), they came to many of the same conclusions (although based on other techniques). Your earlier visualization was also a bit reminiscent of Matt Daniel's award winning visualization of the "Largest Vocabulary in Hip-Hop."